Because a SHMUP requires a player to be keenly aware of where enemy bullets are located, they must stand-out from the rest of the graphics in the game. As a result, such projectiles are usually brightly colored. Some games go so far as to make them flash different colors in order to make them more easily noticeable. Enemy projectiles are one of the few cases where it may be advisable to ignore the color palette of the rest of the game and purposefully render them with conflicting colors. In terms of draw order, enemy projectiles should also occupy a rank commiserate with their importance to the player. What this works out to is that enemy projectiles should generally be rendered on top of most other objects in the game. The last thing you would want is to have bullets hiding behind power-ups leading to unfair player deaths. At first glance, it might make sense to have player and enemy projectiles travel at the same speed. 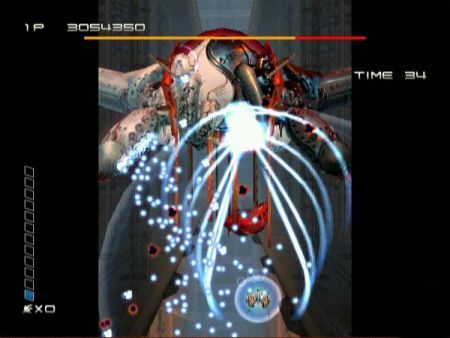 While that symmetry may seem attractive, it ignores the differing purposes served by player projectiles and enemy projectiles. Mainly, player projectiles are meant to hit enemies while enemy projectiles are meant to be dodged. Player projectiles need to be fast so that they hit enemies effectively and enemy projectiles need to be slow so that the player can avoid them. I learned this lesson the first time I tried making a SHMUP. I started out with both player and enemy projectiles having similar speeds. As a result, enemy projectiles were so fast that I rarely had a chance to avoid them once they fired. The only way to avoid damage was to destroy enemies before they fired. One day, I tried halving the speed of enemy projectiles. The game immediately changed. Instead of try to destroy enemies just as they came on the screen, I was weaving around fields of projectiles to get good shots on enemies. And it was a whole lot more fun that way. This may seem like a no-brainer, but I can’t understate how important it is for collisions between players and enemy bullets to be a significant event. In games with one-hit death, this condition is cleared because the loss of a life provides a clear enough sense of consequence. Games where the player can take multiple hits need to provide a lot of feedback to make collision with enemy projectiles a suitably jarring experience. U.N. Squadron does a great job of this by having alarms go off when the player is hit as well as putting the player in a temporarily vulnerable state where one more hit will instantly finish them off. Sine Mora also does this well by having the player’s accumulated power-ups fly out thereby forcing the player to drop what they were doing and concentrate on recollecting power-ups. Enemy bullets are key to making a SHMUP fun. If you ever find yourself building one, remember: enemy projectiles should be Bright, Slow, and Deadly.